If a beer glass isn’t cleaned properly, then the invisible film left on the glass from the improper washing will kill the head of the beer. That’s why it’s important to choose a bar glass cleaner that’s strong enough to remove dirt, grime, and lipstick from glassware, but gentle enough that it won’t affect the beer’s head or taste. Also, by keeping glasses sparkling clean with a third sink sanitizer, beverages will look more appealing, which can lead to increased profits and customer satisfaction. Also make sure to check out other great items from Advantage Chemicals, Noble Chemical, 3M, Bar Maid and Pure Bright. Once happy hour hits, it can be difficult to keep up with the amount of dirty glasses coming through the dish room. By having a reliable bar glass cleaner in supply, your staff will be able to rest assured that once glassware has been cleaned and dried, it will have a sparkling shine. You can also find eco-friendly cleaning solutions for use in your environmentally-conscious establishment. For more great products to use during the dishwashing cycle, check out our glass racks, dishwasher aprons, and wet area floor mats. 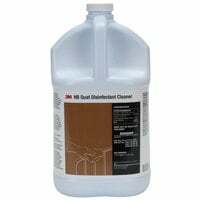 If you're wondering where to buy 3m bar glass and glass washing & sanitizing chemicals, we have a large selection of 3m bar glass and glass washing & sanitizing chemicals for sale at the lowest prices.